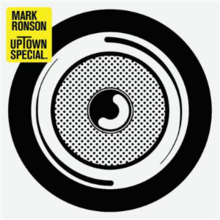 Uptown Special is the forthcoming fourth studio album from British producer Mark Ronson. If we take a look at his past releases we have a fairly scattered Record Collection (if you’ll pardon the pun)- a guest spot-filled debut Here Comes The Fuzz which flopped commercially despite having an array of excellent songs, his sophomore- Version took aim at the charts and well-and-truly achieved this, spawning hits such as Valerie and Stop Me. Third album Record Collection was a bizarre fusion of everything from synth-pop to hip-hop, leaving us wondering what Uptown Special could be all about. The unstoppable Bruno Mars-assisted lead single Uptown Funk is in my eyes a modern day classic, a gem of a track that is one of the best things to come out of pop music all year- not that there hasn’t been challengers, but Uptown Funk really is one of those songs. So if the lead single was anything to go by, then hopefully the rest of the album would follow in suite right? Well, yes and no. Some of the tracks on Uptown Special are strange to say the least, obviously stemming from Ronson’s Record Collection train of thought, such as with Daffodils. Where as horn-filled anthems of Version’s aura are also on the LP- I Can’t Lose featuring Keyone Starr for example. Then out of nowhere we’re presented with Crack In The Pearl which reminds me of Phil Collins’ darker days. With this assortment of tracks all presented as a finished LP, it leaves me wondering where on earth is this album going? Don’t get me wrong, the album has it ups, there’s a lot of songs to write home about- such as with the riff-driven In Case Of Fire, or the soulful Heavy and Rolling, but Uptown Special definitely has its downs as well, particularly the autotuned-headache-summoning Leaving Los Feliz. You can almost split the album in two with how bad some songs are compared with how good others are, but at the end of the day, it can’t really be an outstanding project if two entirely oppositional qualities exist on the same disc.